New non-stop flights add to the airline's raft of services from the US to The Bahamas. The daily service has the potential to bring 100 visitors to Nassau on each flight. Pictured: JetBlue's Marty St George presented Hyacinth Pratt, permanent secretary in the Ministry of Tourism and Aviation, with a model plane in commemoration of the airline's inaugural Westchester to Nassau flight. In turn, Pratt presented St George with a collection of Bahamian coins. JetBlue is already the largest carrier from the US to the Caribbean. In The Bahamas’ market alone, its airlift totals 28,000 seats per month. It has the potential to bring up to 336,000 visitors here annually. On November 15, JetBlue launched its new service between Westchester, New York, and Nassau. The new daily flights are serviced by the 100-seat Embraer E190 jets. Flights depart Westchester at 8:10 am and arrive in Nassau at 11:10 am, giving visitors the rest of the day to start enjoying their vacations. The new flight represents the only international service out of Westchester County Airport and JetBlue’s only flight from Westchester that does not stop in Florida. “The Minister of Tourism believes this new service further demonstrates the viability of a most successful partnership between The Bahamas and JetBlue,” said Hyacinth Pratt, the permanent secretary in the Ministry of Tourism and Aviation (MOTA). She made the remarks at a welcoming ceremony held in Lynden Pindling International Airport’s VIP Lounge. Since JetBlue introduced its first direct flight from New York to Nassau in 2004, the relationship between The Bahamas and the airline has grown steadily. In addition to the Westchester-Nassau service, JetBlue now serves Nassau non-stop from Boston, Fort Lauderdale, Orlando and New York’s JFK Airport. “The Bahamas Ministry of Tourism and Aviation values this highly successful relationship and, in welcoming this new service we freely indicate our receptiveness to discussions about other initiatives from other gateways. We remain committed to strengthening this relationship as the years go by,” added Pratt. JetBlue has continued to expand its airlift to The Bahamas based on “extremely strong results” St George said. 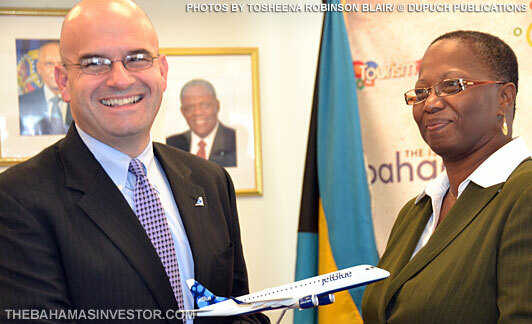 The Bahamas, he notes, has been “a tireless supporter” of JetBlue since its entry into the market. In January, the airline won The Bahamas’ prestigious Cacique Award in the Airline of the Year category. St George believes the new service provides JetBlue with yet another opportunity to bring high quality service at low fares. When the Lynden Pindling International Airport’s redevelopment project is completed in 2013, it will be able to accommodate up to five million passengers a year. Presently, it handles around 3.3 million. “It is clear that we are building for the future,” said Walkine. JetBlue’s inaugural flight from Westchester brought 98 travellers to The Bahamas, most of them first-time visitors. The Bahamas Financial Services Board (BFSB) celebrated the 11th anniversary of its Industry Excellence Awards programme on November 11, at a gala dinner held at the Sheraton Nassau Beach Resort.